This is a re-write of this old post where I look at Macquarie Park Cemetery & Crematorium. The original post was written a while ago, and now I have more photos and information. So it's only appropriate I write a new post in the wake of the open day. Macquarie Park is my favourite cemetery and crematorium for a number of reasons. It offers great value, is easy to work with and the staff are great. But I also have academic reasons for liking Macquarie Park. It is a shining example of modernity in action. Everything about it (especially the crematorium and reception rooms) are great studies of modernity in society. And it is very accesible, the staff and organisation are fairly open and honest. I would strongly recommend going to Macquarie Park for cremations or burials. From value and quality to research possibilities it does well. There is often confusion between Macquarie Park and Northern Suburbs Crematorium. The two are next to each other and until recently shared a name. Macquarie Park was once "Northern Suburbs Cemetery". But then they built a crematorium and had to change names. So make sure you are going to the right place before going there! Having said that the two are only 5-10 minutes drive appart. Macquarie Park is located on Plassey Rd, North Ryde. Not in the suburb 'Macquarie Park'! The page by Macquarie Park on how to get there. Towards the bottom are pre-done google map directions. Which is quite helpful. Or you can use the one I link to above. By public transport: This can be the tricky part. Many people go to Macquarie Park Station assuming that Macquarie park cemetery & Crematorium is close. But it isn't, it's much closer to North Ryde Station. There is also a bus stop right outside the place, on Plassey Rd. Just make sure to go to North Ryde and not Northern Suburbs or Macquarie Park! By car: This is the most common way people go to a cemetery or crematorium (especially on a funeral). It is also the simplest and easiest way as Macquarie Park is designed to get to by car. The only issue is if traveling North along the M2 to keep left in the Lane Cove Tunnel. The exit for Macquarie Park is only a very short distance from where the Lance Cove Tunnel ends. So if you are not already in the left lane you can easily miss the exit. The next place to turn around is a 20+ minute drive each way, making you 40+ minutes late. So keep left in the Lane Cove Tunnel. Navigating Macquarie Park should be easy. It is well designed and thought out. The crematorium is located right by the entrance, it is the first right as you drive in. The main office and reception rooms are only a short walk from this car park. Or you can just drive a little further down the road to reach the main office car park. View as you enter the grounds. Map boxes are scattered through the grounds, mostly towards the entrance and by the crematorium. These letterbox type things have a map and a newsletter for anyone interested. Signs are scattered through the grounds. Intersection with a coloured dot. The Green Line ends at the main office entrance. The Green Line is a green line pained on the road as you enter. Starting shortly after the entrance it leads directly to the cortege waiting bay and the main office. This is the line the funeral cars take when going to the cemetery. When entering the cemetery with a funeral or to visit the main office/reception rooms then follow the Green Line. The picture above shows the Green Line starting. Key intersections at Macquarie Park have a large coloured spot pained in the center. Each intersection has a different colour spot. This makes navigating and giving directions very easy. Such as "turn left at the yellow spot". An issue with cemeteries is that they do not really have land marks, this is a great and genius way around that issue. The colour spots are listed on the larger maps, get a map with this and you should not get lost. A green spot at an intersection. List of facilities on the Macquarie Park website. There are quite a few different facilities on offer here. Most of which are new, having been opened in the midd 2000s. The crematorium was opened in 2004. Located just to the right as you enter it is easy to spot and find. It was revolutionary for Sydney as no other crematorium had been built like it. It was based off a new crematorium in Victoria which had been successful, but nobody was sure if this style would work here. However the risk was taken and it paid off as Macquarie Park now leads the way and sets the standard for crematoriums in Sydney. is just to the right, where the red arrow is. There are three chapels at Macquarie Park. The first in line as you enter is the Magnolia, followed by the Palm then finally the Camellia. An interesting fact is that the first letter of each chapel is the initials for the crematorium. Magnolia (M), Palm (P), and Camellia (C) to make MPC. All three chapels are identical here, except for the colour of the chairs and curtains. As they explained on the open day, this is done deliberately to make them easy to customise for a funeral. That through the simple and similar design they can quickly and easily make the chapels appropriate for any religioun, custom or desire. Funerals start at each chapel at different times. At the Magnolia chapel they always start on the hour. At the Palm funerals start at quater past the hour. Finally at the Camellia they start at half past. This is done so funeral staff know which chapel the funeral will be at without having to look it up. Which makes organising and explaining things easier. But it is also done to prevent everyone going in and out at once. Cover over each chapel entrance. Each chapel seats 200 people but has standing room for more. There is also an overflow garden area to the side of each chapel. So if there is a large funeral people can also go here. There are TVs and speakers in the garden and the wall is glass so people can see in. Toilets are located outside and to the left of the chapel when facing the main door. They are on the way from the main door to the garden area. They are clearly marked, clean and decent. Finding and using them should not be an issue. The chapels have a special AudioVisual room where the concierge sits and oversees the funeral. I will explain more about the concierge below. But this room is full of high quality equipment to play DVDs, CDs, music or anything else on the funeral. The acoustics in the chapels is also good. Each chapel has a good sound system and was designed to have good acoustics. I have heard live bands and CDs here, all of which sounded good. There is also a "family room" in each chapel. This is a sealed room off the foyer for those who want or need privacy. People mostly use it as a change room. But it is also intended to be used by those with children. The room is soundproof, so noisy children will not disturb the funeral. There is also a box of toys and kids entertainment at the side, comfy couches to sit on and a coffee table. It has a TV and speakers to see and hear the funeral service, but it also has a large window so one can see the funeral at all times. A perfect room to see the funeral but not disturbe the funeral. With a playground at the reception rooms it is evident that Macquarie Park has done all it can to support those with children. You enter the chapel through glass doors and walk into the foyer. To the left is the concierge/AV room, and to the right is the family room. Another set of glass doors just in front lead to the chapel itself. 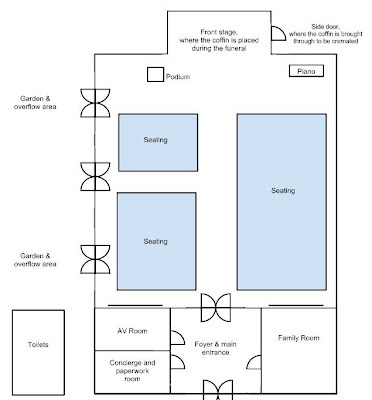 Chapel layout, not to scale. View as you enter the chapel. Garden to the side of the crematorium. Side door which leads from the garden to the chapel. Little garden beds and signs are placed along the crematorium. take the coffin through to the back area. Behind the chapels is the back area, where the bodies are actually cremated. This was on display during the open day and they were happy for me to take photos. The coffin is taken through a hidden door at the front of the chapel. They use a special catafalque to move it, so little actual lifting is done by the staff. Once brought through the nameplate is removed and placed with the paperwork. If the coffin has large metal handels they are removed and placed with the ashes at the end of the process. After this the coffin is either put in the 'burner' (also called a retort) or into a holding room. If there are too many bodies to cremate that day they are stored in a special holding room until the next day. The maximum a coffin is held without cremation is 24 hours. There are three 'burners' at Macquarie Park. Two standard ones and one large one able to do oversize (obese) coffins and bodies. The large burner cost over $250,000 and was installed sometime in 2011-2012. These burners are state of the art for Australia, all but completely automated. Data is also sent to Melbourne for backing up. So in Melbourne there are records of how hot and long the cremation process is for each body. Control panel for the burner above. One of the two standard burners. In the back area there is a witness room. It is a room for mourners to sit in and watch the coffin being cremated. The room has couches and is quite nice. Whether it be the main office and reception rooms or crematorium, parking is easy and convent at Macquarie Park. There are plenty of car parks by the crematorium, and the walk is not only short but flat and paved. Macquarie Park also run a courtesy shuttle if needed, which I will explain in detail below. While there is plenty of parking by the main buildings, the cemetery can be a different matter. There should never be a shortage of parking in the cemetery. But one might have to walk a distance and over the lawn. View as you enter the crematorium car park. Plenty of disabled car parks right next tot he crematorium. There are more photos of the crematorium in my post on the Macquarie Park open day. The cemetery at Macquarie Park is well maintained and organised. The gravediggers are good people who do a good job. They help on the funeral if needed and are always nice to interact with. The grounds themselves are always maintained. Grass is kept down, dirt patches are minimal and there are few weeds. However like any cemetery the ground can be uneven, soft, muddy in the rain and so on. One of the good things about the cemetery is that there are plenty of decent toilets scattered about. You should never need to drive for long to find the toilet. It is also one of the best organised cemeteries. With colour spots on the intersections, sign posts and street names everywhere getting about is relatively easy. Clean toilets scattered about the grounds. Some new vaults/crypts near Ascension Hill. Large turning circles are placed to the side as a space to park or turn around. Little statues scattered around Ascension Hill. A large life size bronze statue on Ascension Hill. Bins and flower holders are scattered about the grounds. Old Western style monumental graves. The reception rooms here set Macquarie Park appart from the other crematoriums and cemeteries in Sydney. Until Macquarie Park most cemeteries and crematoriums did not have reception rooms. Having them on site like this makes them convenient and easy to get to and find. Most mourners are older, so a long trip or even another trip is often inconvenient. There are three reception rooms of different sizes, all of which open to an outside area. They are quite nice rooms. Within close distance are toilets and the main office should one need to talk to staff. But better still is a playground, fenced in and decent. The playground is within sight of the reception rooms making this a perfect place for those with children. All reception rooms come catered (if desired). I believe the catering is done by Celest Catering, but I could be wrong. Celest is a great catering company that is fast becoming the standard choice for the funeral industry. They cater a lot of funerals (and other functions) and know what they are doing. With quality food and staff you should not be disappointed. One of the best things about Macquarie Park crematorium is the concierge staff. 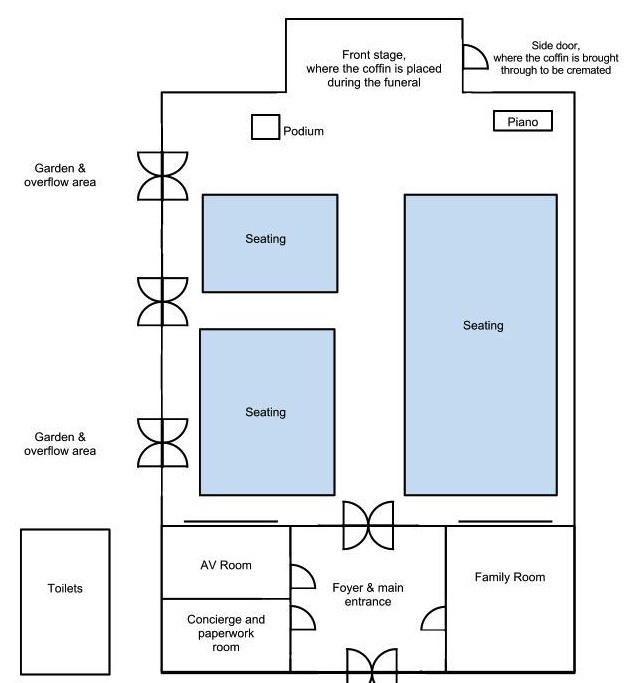 As part of the cost of using the crematorium you get a concierge who will run any and all AudioVisual equipment and displays. The concierge will also record the service if requested. Having the concierge is no extra cost, great value compared with other crematoriums. Other places like Eastern Suburbs Memorial Park charge to have the staff show you how to use the AudioVisual equipment, let alone run it for you. If needed there is also a free shuttle service to get about the grounds. It is basically a special and long golf buggy. They will send it to pick you up and then it will take you right to your destination. Many other places now do this, however not all offer this. The shuttle is driven by the grounds staff, who are all nice. If you need the shuttle then simply ask one of the staff members. But keep in mind that it might take time as they might be busy or it might already be somewhere. By far the biggest asset to Macquarie Park is the staff. They are nice, professional and great to work with. In my briefe time as an undertaker I never had or heard of an issue with interacting with the staff. I have also heard mourners speak very highly of the staff. I do have some issues with Macquarie Park. It is cold and modern, the crematorium does not have the character of Northern Suburbs Crematorium. Or the atmosphere of Eastern Suburbs Memorial Park. Macquarie Park has gone for efficiency and ease of use over atmosphere and looks. Everything about Macquarie Park is calculated, deliberate and thought through. Which unfortunately loses a certain something of older, less practical crematoriums. My other issue is with the website. It looks and feels old, as in out dated. This is something a few established places fall victim to, such as WNBull Funerals. The website is just old fashioned in colour and layout, reminding me of the midd 2000s. Plus the user interface, while improved is still not great. Little things, like asking people to complete a survey and email it back to them. Survey Monkey has been out and about for years, Google Documents also has a free online survey tool. Both of these methods collate the data for you and it's much easier to use. Asking people to basically print out then scan and email or post a survey is just strange and inefficient these days. List of events at Macquarie Park. - Open Day; every year they hold an open day in early September. I wrote a post about the 2012 open day. It was free and great fun. - Historic tours; I have heard that there is a historic night tour of the cemetery every month or so. While I intend to go I have never been and cannot say what it is like. - Open Day; mothers day and fathers day both have events (as with almost every crematorium). Main office is open weekdays, from 8:00am to 4:00pm. The cemetery is open from 6:00am to 7:00pm everyday. The crematorium chapels are not open for 'inspection' without asking. You can go and have a look but might get in the way of a funeral. If you want to see the crematorium for whatever reason then ring ahead. Directions and maps of how to get to Macquarie Park. Prices, fees and funeral information. Map of the cemetery and grounds (downloadable PDF). The main intersections on the map show the coloured dots on the road. They also have the colour written under the dot so it can be printed in black and white. It is most legible printed on A3, but will work on A4. All photos shown were taken by me, and are owned by me. I encourage them to be used how or where you like but appreciate being credited properly if possible. Well I'm glad you took it as a positive! I forgot to point out that the MCP website is the only one to use google maps (that I know of). Which is great for finding the place as it is easy to use and stays updated. It's also good to hear MCP is aware and addressing this :) and the new search features sound quite useful. many of your links lead to error pages as does the actual map of your facility. I was looking for Mary Mackillop Gardens and of course without a site map is impossible. Your website is tired & outdated with non of the bells & whistles expected in 2016. I unfortunately have to attend a funeral there today, otherwise I wouldn't be seen dead there.